It involves a wet and muddy hike but wildlife encounters don’t get much more exhilarating than this: face to face with a gorilla family in their rainforest sanctuary. 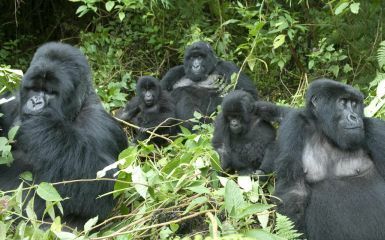 Gorilla trekking in Uganda or Rwanda gives you the best opportunity to see these critically endangered great apes. You’ll be rewarded with unforgettable memories as well as the homely comforts of specially designed trekking lodges. Expert guides and rangers lead the way, their expertise promising a 90% success rate at finding a gorilla family. Accustomed to our excitement and tolerant of our presence, the gorillas range from wide-eyed babies and their fussing mothers to mischievous teenagers and stern-browed silverbacks – you’ll have amazing photographic opportunities as well as time to simply sit and watch the gorilla family at work and play. 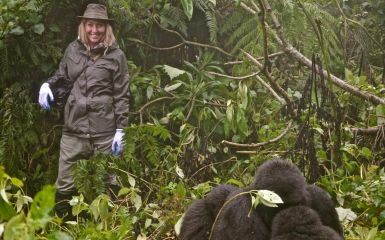 Uganda and Rwanda have a similar climate so the best time for gorilla trekking applies to both countries. The rainforest has two dry seasons: from mid-December to the end of February and from early June to late September. These are considered the most comfortable times for trekking as there is little rain but note that rainforest conditions are still humid and muddy. Temperatures stay in the mid to late 20s Centigrade (77 – 83 degrees Fahrenheit) for most of the year. 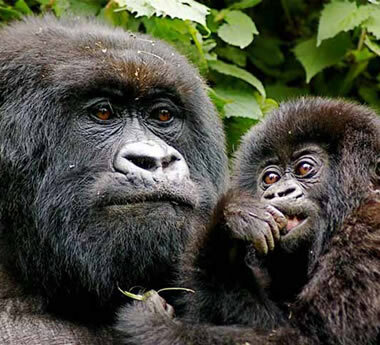 You can’t go gorilla trekking without one; one permit per person per visit. We include them in our trekking packages and there are a few things you should know about them. 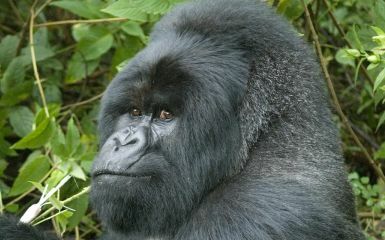 A gorilla trekking permit allows you an hour with the gorillas at a distance of at least 7 metres/20 feet. Flash photography is not permitted though personal video recorders are allowed. Trekking permits are non-refundable except for valid medical reasons with a medical certificate. You will not be allowed to go gorilla trekking if you are sick with a contagious disease like a cold. Gorilla trekking may further be cancelled at short notice by park authorities: in such circumstances, refunds are at the discretion of the authorities and lie outside our control. Led by local expert guides, gorilla trekking involves hiking through dripping rainforest while trackers cut a path through the dense foliage. There’s a lot of up and down walking on muddy paths and even during the dry season it’s wet and humid in the forest. Given the altitude, it’s also cold at times, especially in the evenings. You’ll need to be walking fit and wearing the right gear: boots (waterproof gaiters are recommended) and light, breathable hiking clothing with a waterproof outer layer. Waterproofing for your camera is strongly advised. Back at camp however you’ll enjoy roaring log fires, hot showers and home-cooked suppers. Gorilla trekking accommodation in Uganda and Rwanda is very comfortable and you’ll have your own suite with private bathroom, viewing deck and plenty of facilities. Rwanda or Uganda - Where's Best? Both destinations deliver Africa’s safest and easiest mountain gorilla trekking plus the same 90% success rate at finding gorillas. 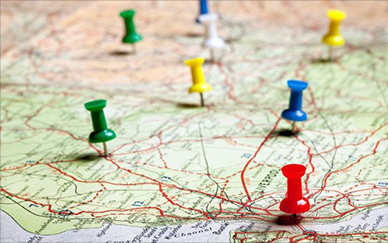 Accommodation in each country is similar and you’ll enjoy the same levels of guiding and hosting. Rwanda is the easiest all round. Fly to the capital Kigali and transfer by road or air straight to your lodge in the Volcanoes National Park and you go gorilla trekking the next day. It’s ideal for a 2 or 3 day add-on tour. 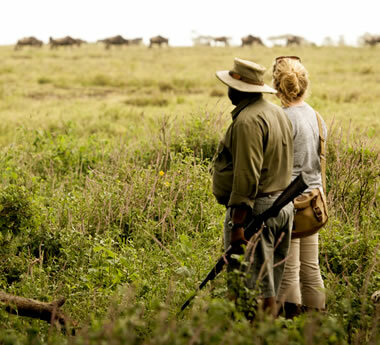 Uganda gorilla treks are usually part of a longer itinerary which includes other wildlife destinations across the country such as Queen Elizabeth National Park and Kibale Forest. 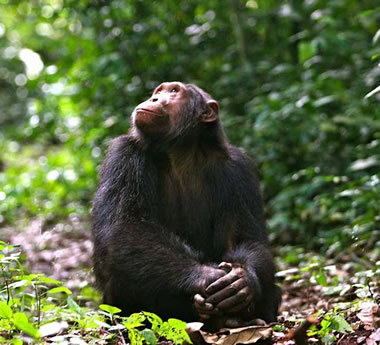 Transfers to Uganda’s gorilla hotspot Bwindi Impenetrable Forest are usually by road though air transfers are also available and recommended for travellers on limited time. 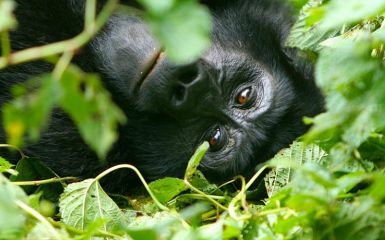 Browse our recommended tours below, each featuring a gorilla trekking safari in Uganda or Rwanda. If you’d like us to tailor-make an itinerary based on your needs and budget, then simply contact us and we’ll be happy to help. Face to face with mountain gorillas in their natural rainforest environment – it’s both a humbling & invigorating experience.